Roll out of Nokia Asha 501 Over The Air (OTA) update has already started and this new update will bring much awaited WhatsApp and various other significant changes. 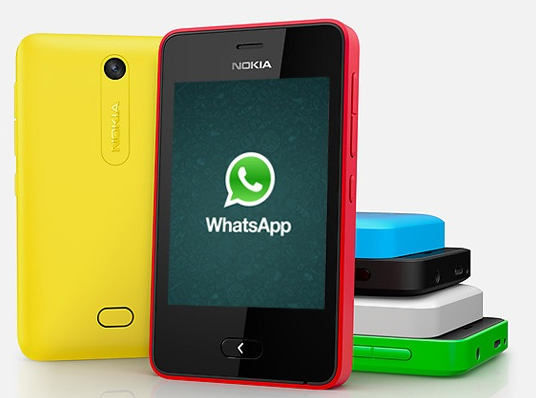 We have received several queries regarding the Availability of WhatsApp on Nokia Asha 501 (Full Review) since it was promised at the Nokia World in Abu Dhabi last month. The software of Nokia 501 has been updated and is now at par with recently announced Nokia Asha 500, 502 and 503. You can now launch the camera by simply swiping up on the lock screen and you can also click pictures by clicking anywhere on the view finder. You can also directly venture into gallery app directly from the lock screen. Various photo editing options have also been added in the enhanced Gallery App. If you wish to share the edited pic on social networking sites, you can do so with a few taps. Changes have been made to the fastlane App as well. It now allows you to choose between full notification icon and full notification on lock screen. Features like interactive alarm and various other apps have also been added to the lock screen. The OTA update also brings in an API for Voice over IP, which means you can now make calls over internet on your Asha 501. For now you can use Nimbuzz for internet calls, and Nokia promises more Apps in the future. To install this update turn on your data connection or WiFi and open the settings menu. Chose ‘phone updates’ from the menu and press ‘Update’. When the update is complete, WhatsApp option will appear on your home screen.